That Simone Biles was going to win the all-around title at the 2018 world championships was something of a foregone conclusion even before the competition in Doha started. The only question was, by how many points? But by the third rotation, she had raised an unexpected additional question: How many times could she fall in competition and still win? This was no hypothetical, because Biles had already fallen twice. Because of how difficult the vault was, even with the fall, Biles was in third place, with three rotations left to go. Her teammate, 2017 defending world champion Morgan Hurd was leading but wasn’t even a full tenth ahead of Biles. Plenty of time to right the ship. Then it was off to beam, where Biles started first. And she was off. Biles fell off on her barani somersault and wobbled on her pike front. Hurd had a chance to take the lead but grabbed the beam during her routine to keep from falling. Biles, despite two major breaks in three routines, was leading by .092 heading into the final rotation. Given Biles’s enormous advantage in start value on floor exercise, it seemed unlikely that anyone could overtake her, even if she did fall again. I didn’t think she would fall on floor but then again, I never thought I’d see her fall on vault. So anything was possible. On floor, Biles, as the top qualifier, was the last one to go. And she started off by going out of bounds on her double twisting double layout. The rest of the routine, however, was very secure. Waiting for the score was merely a formality. Biles earned an even 15 to defeat Japan’s Mai Murakami by 1.693 points, the largest margin in women’s world championship history. And Hurd took the bronze, just .066 shy of the silver. Last year in Montreal, Murakami, who had led all-around qualifications in 2017, missed out on an all-around medal due to a fall and placed fourth, a tenth away from the podium. This year, when her floor score was announced and she moved into first, ahead of Nina Derwael of Belgium with just Biles and Hurd to go, Murakami started crying. She was guaranteed the all-around medal that had eluded her last time. But this was the Simone Biles show. 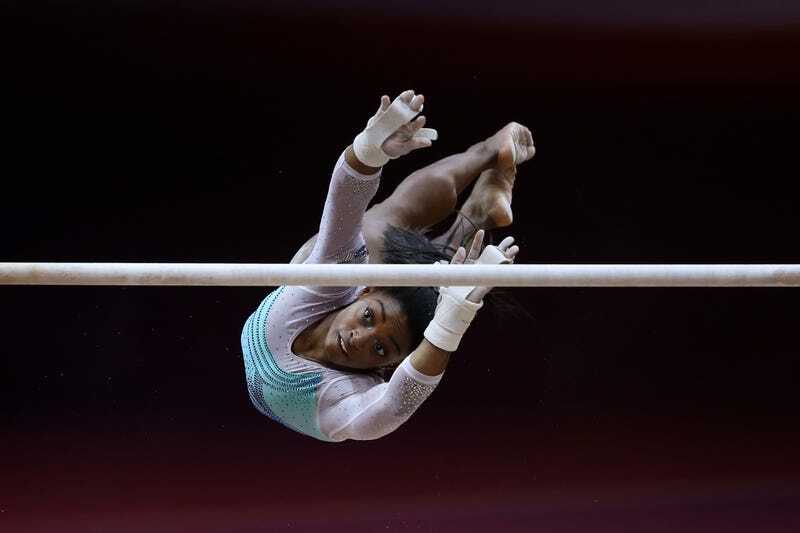 With the gold, Biles became the first woman to win four all-around world titles. (She had been in a tie with Russian Svetlana Khorkina.) She also tied Vitaly Scherbo for most world championships golds won with 12. Biles’s win today was made possible by the high degree of difficulty with which she competes. Even before the competition starts, she’s already ahead, based on her routine start values. This was true in Rio and it is even truer now. But winning hardly seems to be the point anymore. Biles has won everything. As 2008 Olympic silver medalist Jonathan Horton noted, she’s here to dominate. To answer the question in the headline—Biles can fall at least three times and still win.